Here is the year's final update to my FTTH and BB database. Many initiatives in the US for pushing BB penetration (sheet #8). FTTN + VDSL: the Australian saga and a German plan from DT and Vodafone (sheet #4). Several steps toward deeper separation (Italy, Australia, Poland; sheet #12). New FTTH deployments plans, including Saudi Arabia, Nigeria, Andorra and several US networks, including Lafayette). New Zealand: FTTH and FTTN (sheets #1 and 4). The audience at our November event seemed comforted by the appeal which the capital markets currently find in telecom as a defensive sector. However, we also stressed that this is likely to be a fleeting phase, as underlying concerns about the industry’s ability to generate sustainable value will return. I do not wish to contest STL's views on telco transformation, but I feel something is missing in this (vastly simplified) summary: probably every industry sector faces challenges, some even bigger than those plaguing telecoms. Obviously, financials come to mind, but healthcare, IT, oil & gas and automobiles have a few issues to sort out as well. Personally, I wouldn't be comfortable predicting which sector is set to outperform the others next year. Somehow, this ties nicely into Kai's (not entirely serious) call for government support of the telco sector, a while ago. Apparently, he was disgruntled over the amount of funds available to bail out financials and the automobile sector that haven't been able to regulate themselves. Why shouldn't FTTH operators get government support as well? To say that stocks are cheap, based on current P/E ratios, shows an appalling lack of historic perspective that plagues the sell-side. Low P/E ratios probably imply that earnings projections are still way too high. It should be commonly known: C-level execs are the very last people to update their views to altered market conditions; only to be followed by sell-side analysts. Axia NetMedia (discussed before) detailed its plans for Australian NBN. If they have it their way, they will build FTTP, not FTTN. The same firm bids on the active layer of the Singapore network (NGNBBN), with Cisco. It's somewhat puzzling to see Axia bid alone (on the Australian NBN, but naturally they need partners), with SingTel (on the NGNBBN passive layer), or against SingTel but with Cisco (here). Maybe there's room to band together before contracts are signed. Swisscom has the revolutionary idea of laying 4 fibers to each home in its FTTH plans. It will use one itself, leaving room for three competitors to engage in infrastructure-based competition. Plus: a worthwile interview. with TransACT's former CTO Paul Brooks. Question: "Telstra said it is 'impossible' to build or maintain a network if structural separation is enforced, is this true?" Answer: "No, of course not. They might not enjoy the same levels of cross-subsidisation they currently access regarding basic network infrastructure costs and high value-add retail products, but that's an economic argument, not an argument about whether it is possible or not. (...) If the wholesale arm actually had incentive to make things easy for their customers, then the business case for the separated retail arms becomes even stronger." Plus: an Australian opposes sub-loop unbundling (SLU), but a New Zealander points to the reality of it, albeit it in FTTN + VDSL deployments. Not just the NFL, but the NBA too: 3-D live broadcasts to theaters. EU objecting to functional seperation of Telecom Italia? This is how subtle it gets: AGCOM (the Italian) NRA proposes functional separation of Telecom Italia. Great, isn't it? Only the second time in Europe, after BT/Openreach/EAB. TI would create a network company Open Access, and an independent board to oversee things. But wait. This time it's the EU that objects. Basically, it fears the terms will be too friendly for Telecom Italia. "The network is our core business." So far, only SingTel and Bharti Airtel (and a more recent story here) have been as enlightened as to step away from this old-style telco thinking. Telecom Italia would have all the reasons of the world: it has a heavy debt load, and taking separation even one step further (structural separation) would allow it to attract third-party funding to roll out FTTH. A major milestone is hit on December 11: Elliott Carter turns 100 years old - and still composes frantically. Obviously it takes some bending and turning to make this relevant for us at Communications Breakdown. Let's put it this way: being 100 years old and in the forefront of whatever it is you are doing, is quite some lesson to anybody - not least to the incumbent telcos of the world. 1908: Elliot Carter was born. Nathan Stubblefield invented his precursor of the wireless telephone. 1924: Carter first met Charles Ives. 1925: Carter first met Edgard Varese. Invention: TV by Francis Jenkins. 1941: Carter composes The Defense of Corinth. Invention: the computer by Konrad Zuse. 1946: Carter writes his Piano Sonata. Invention: Mobile Telephone Service at AT&T. 1947: Carter writes The Minotaur. Invention: the transistor by William Shockley et al. 1948: Carter's Cello Sonata sees the light. Claude Shannon publishes his Mathematical Theory of Communication. 1952: Invention of optical fiber by Narinder Singh Kapany. 1955: Carter composes his Variations for Orchestra. Invention: video phone by Gregorio Zara. 1958: The world's first communications satellite by Kenneth Masterman-Smith. 1964: Carter's Piano Concerto. Invention: packet switching by Paul Baran et al. 1969: Carter composes his Concerto for Orchestra. Invention: Arpanet at the USDD. 1971: Carter completes his Third String Quartet. Invention: e-mail by Ray Tomlinson. 1973: Invention of ethernet by Bob Metcalfe et al and the PC at Xerox PARC. 1977: Invention of the mobile phone at Bell Labs. 1980: Carter's Night Fantasies. Invention: the CD at Philips and Sony. 1983: Carter's Triple Duo. Invention: the Internet (TCP/IP) by Robert Kahn et al. 1988: Carter's Remembrance for Orchestra. Invention: ADSL at Bellcore (now Telcordia). 1990: Invention of the WWW by Tim Berners-Lee. 1993: Invention of GPS at the USDD. 1995: Carter writes his Fifth String Quartet. Invention of the DVD at Philips et al. 1997: Carter writes his opera What Next? Invention of DOCSIS at CableLabs. 2001: Carter's Cello Concerto. Invention: the iPod at Apple. This is very ironic; while all of Australia is debating the six proposals to build a National Broadband Network (based on FTTN), the city of Brisbane (1.9m pops, 918 km^2) has ordered a study into the feasibility of constructing its own FTTH network. The city targets 0.1-1.0 Gb/s to every home and business, that is: True Broadband. This is supposed to generate 15k jobs and add AUD 5bn to the local economy. Doing a little back-of-the-envelop calculus, the latter figure looks like around 6% of Brisbane's GDP. Not bad! Telefonica trials 3D TV over its Sao Paulo FTTH network. Cooperates with Philips for TV sets. Football game broadcast in 3-D across the US. The NFL cooperates with Thomson and Real D.
Jeffrey Katzenberg, at DreamWorks involved with the TinTin movies, expects it will take a while before people will be prepared to make another big cash outlay for a 3-D set, now that flat-screen TVs (which are not '3-D ready') have become widespread. Should Philips contribute to the cost of the electric grid? There are never enough people to debunk the crap coming out of some people . Take a look at Scott Cleland 'study' for 'NetCompetition.org' (conclusion: "Google uses 21 times more internet bandwidth than it pays for"). Google itself responded very aptly, and fortunately there's always the eloquent DSLreports.com. Google pays a lot to put its content in the cloud. Consumers pay a lot for the use of the last mile. These are two entirely different things. It is the task of ISP's to collect money from end-users for the bandwidth they 'consume'. Here lies the rub: the Internet only took off when always-on internet access was introduced for a flat fee. That's when telcos and cablecos lost their pricing power. But it just doesn't make any sense to turn to the other end of the value-chain and try to collect money from Google. It's like saying that Philips Electronics should contribute to the cost of the electric grid, because they make so many apparatuses that use electricity. It's the business model that's broken. Telcos and cablecos should not ask people to degrade themselves producing these crappy studies. Instead, they should try to fix their business model. A lot of consultants are out there to help them. 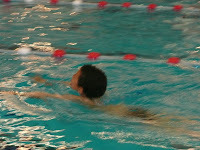 My son takes swimming lessons, and I discovered there is something distinctly fishy about it. It has all to do with perverse incentives: the teachers have no interest in making him go through the course in the shortest possible time. That would only endanger their jobs. No, this story will not lead to the GFC (global financial crisis), but to telecoms regulators. They too are perversely incentivised. They have no interest in deregulation, because it will make them lose their jobs. I had an interesting email conversation with a highly valued reader on the upcoming regulation (tariff proposal December 19) of the planned KPN/Reggefiber FTTH network. Turns out, political issues and sensitivities are all over the current negotiations between KPN, Reggefiber, OPTA (the Dutch NRA) and NMa (the Dutch competition commission). I have no such sensitivities at all - for that I beg your forgiveness. First, it wants the joint venture with Reggefiber (Reggefiber FttH, AKA Glashart) approved by NMa. This is expected before the end of the year. It starts off with a minority interest for KPN, in order to get the whole thing unregulated, or at worst, under NMa's jurisdiction. In due course however, KPN wants to exercise its call option to turn its stake into a majority shareholding. They want to fiber up the country. Multiple sources tell me that KPN suffers a slight (read: severe) form of panic over competition from the Dutch cablecos (Warburg/Cinven's Ziggo and Liberty Global's UPC, mainly), which have near nationwide coverage. FTTH is just one way to stop the bleeding. Beefing up the TV activities is another. Also, they are heavily lobbying for open access to cable networks - which is not going to help (cablecos cannot resell voice on the KPN network, and KPN cannot resell TV on the cable networks; they are supposed to invest in infrastructure and launch their own copycat service, in order to create intermodal competition - this is OPTA policy). It wants to stay in business. Losing regulation of the FTTH market would put it out of business for a large part. It wants to remain independent, not be part of NMa, a political topic. Instead, it wants to merge with the Commissariaat voor de Media, the Dutch media authority, to form an Ofcom or FCC of sorts (but without the spectrum jurisdiction, which resides at yet another agency, the Agentschap Telecom). On its part, OPTA cannot afford to block progress and Keynes style investments. We are talkings billions of euros here, and a big impact on the economy. OPTA can hurt KPN by delaying its decision making. Not a very complicated task for a government agency. See above: KPN wants to move fast in order to stop the bleeding. KPN can put OPTA partly out of business by staying under the radar (by having a minority interest in the joint venture). The minority interest would imply that the entire access network wouldn't be regulated anymore. This would have huge Europe-wide consequences, which is why the proposed Reggefiber deal is tracked in every telco boardroom and NRA agency in Europe. OPTA assigns Reggefiber FttH SMP (significant market power), which is legally highly contestable, in order to be able to regulate it. KPN accepts this, in order to get NMa approval (for which OPTA gives input, which in itself is legally contestable too). KPN also wants OPTA to copy/paste the Reggefiber business model to arrive at the proposed wholesale prices and caps. The call option plays a crucial role. It implies that GNA (Amsterdam) and AFC (Almere) may remain outside the joint venture, because KPN/Reggefiber only has a minority stake. One last word. In case you were wondering how OPTA came up with the EUR 2,50 additition to Reggefiber's line rental price to arrive at the proposed wholesale caps: there was no financial modelling involved. Just politics. To add to Benoit's story: I posted before on the telepresence market and put together a number of market players, taken from this article. Besides Teliris and Cisco they are mainly Tandberg, Polycom, LifeSize and Telanetix. Over the past three months (that would be Q3) meetings increased by 20-25% (Teliris also manages the service, so they have insight into these data). The average use of the system at Teliris' customers is an impressive 125 hr/mo, or 6 hr/day (for comparison: the average use of videoconferencing is 10.5 hr/mo). Check out this 8 minute YouTube video (embedded above) done by Marc and available on his blog too (the last minute or so is the coolest!). He demos the Teliris InterACT TouchTable ("no, this is not the Microsoft surface table"). Really amazing to see how he pushes a document across the ocean. Our fifth poll has ended: how many infrastructures do we need for proper intermodal competition? The question was meant to be taken really in a very general sense, but focusing on access networks. If we go by the winner (48% voting for a single infrastructure), the conclusion could be: we only need one FTTH network; and let's start unbundling those mobile networks too! Obviously, we need some rules to make a monopoly work, however.